Sorry there haven’t been many posts of late. I haven’t been feeling like cooking for one reason or the other, the latest being, I have a bloody head cold. Waking up every morning with a headache is quite wearing. As a result of my lack of enthusiasm for cooking, we have been eating meat and three veg more often than not. I have been building up to making spinach and ricotta cannelloni for a while. We have quite a bit of spinach, silverbeet and beetroot leaves in the freezer and, I thought, the old favourite would be perfect to help use them up . Cannelloni with spinach and ricotta was, at one time (about 20 years ago, I think), ubiquitous. It was one of only two vegetarian dishes that appeared on Australian restaurant menus. The other was vegetable parcels. I used to make it regularly but haven’t for ages – years and years. I don’t even know why I thought of it. Yesterday was a cold, rainy day. We were trying to mulch around our vegie beds but, periodically, were having to come in out of the rain. I was feeling very guilty about the lack of quality meals and the dud the night before. I thought I would make the cannelloni between showers. To my surprise, with all my cookbooks (about 250), I only had one version of this once ubiquitous dish. The one recipe was by Sally Wise in Out of the Bottle. I haven’t had this book for long so I knew that wasn’t the recipe I used to make. It took me a while to work out where I’d find it. Finally, I remembered the cut out from the back of a San Remo Instant Cannelloni packet in our recipe scrapbook. Yep, folks! That is where this recipe comes from. Amazingly, when I bought some cannelloni to make the recipe, I checked out the packet and the very same recipe was still there, albeit with slightly different quantities. I was surprised, again, when I found how simple this recipe is. I had forgotten. I started out reluctantly but my enthusiasm perked up as I realised how little effort was required. I was able to do all the preparation – literally, a few minutes – between showers. Best of all, when we came in from the paddock, cold and wet, dinner was prepared. All it needed was some cheese sprinkled on top and to be popped in the oven. This is a perfect make-ahead dish. These quantities serve two. If you are cooking for one, just split the filled tubes between two small oven-proof dishes and you will have dinner for two nights. Ideally, you need a baking dish that fits 10 cannelloni tubes snuggly. Ironically, despite all the dishes I have, I didn’t have one so our cannelloni were swimming around in a bigger dish than needed. Approximately 10 instant cannelloni tubes. Mix the spinach, ricotta, egg yolks, grated cheese, garlic, nutmeg, salt and pepper together. Put mixture in a piping bag with a plain round nozzle. Pipe mixture into instant cannelloni tubes. Combine tomato puree, basil, salt and pepper in a saucepan and bring to the boil. Grease an oven-proof baking dish with olive oil. Pour a layer of the sauce (about ⅓) into the baking dish. Place the filled cannelloni tubes in a single layer, side by side, in the baking dish. Pour over the remaining sauce. Bake in your preheated oven for about 30 minutes. This entry was posted in Eating your bounty, Pasta and Rice, Something Simple, Spinach, Silverbeet etc, Vegetarian, What's for dinner? by Glenda. Bookmark the permalink. I just wrote about how many cook book I have! I admitted to more than 20 but 250 is impressive. I’m not out of double digits – yet 🙂 I try recipes on the packets too – I just made some cinnamon spelt biscuits from the spelt flour packet they were great. It’s good to put something comforting and easy on the table sometimes – this recipe is perfect. Hi Nancy, You are going to have to start buying more books – 20 is not that impressive 🙂 I still haven’t made your sunken drunken chocolate cake but it is on top of my to do list. It sounds so good. 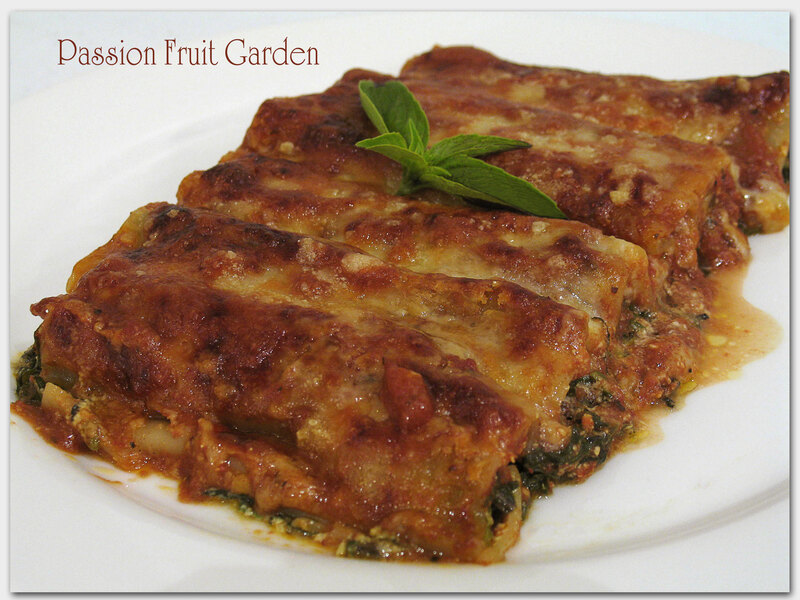 When my girls ask for a special dinner they ask for either scallopine or this – spinach & ricotta cannelloni! They love it and I love it because it is so easy! Hi Kate, I had forgotten how easy it is. Your girls have good taste. Wow, this does sound pretty easy to make. I never would have attempted it because I just assumed it was much more involved. Yours look wonderful – and you even added the little garnish on top! Sorry to hear you’ve got a cold…no fun at all. I haven’t had one in years and thought I was coming down with one yesterday but now I’m pretty sure it’s just a reaction to an incredible pollen year. Feel better soon. Hi Diane, I hadn’t had a cold for a long while but now I have had two within a year. I am already feeling better. Another day or two and I will be all smiles again. Hi Liz, I don’t know how such an old favourite has dropped from our radar. It’s amazing that people do make the recipes on packets. I know I do. Ages ago I was looking for a recipe and a reader told me it used to be on the caster sugar packet. Amazing, it was the exact recipe I was looking for.